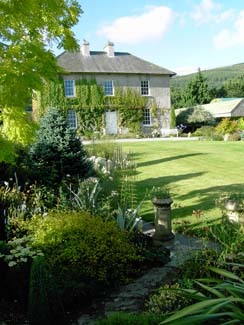 A serene 1880 farmhouse with views south to the Comeraghs, a crystal stream flowing from Slieve Namon and the ruins of a 16th century church are some of the blessings of Killurney Garden. Complement them with imaginative design and the knowledge of a keen plantswoman and you can understand why this garden carries off prizes. Mildred Stokes began gardening seriously in the mid 1980s and her garden has been evolving ever since. 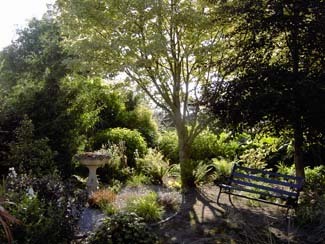 The stream which runs along the side of the property was diverted to create a pool, an old orchard was rooted out, and bit by bit an informal area was created where paths wind through a wonderful collection of plants, with lovely vistas and plant combinations at every turn. 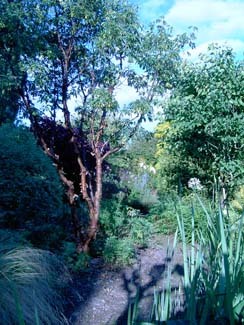 There are many unusual trees and shrubs, Abies pinsapowith a giant first cone, Acer‘Bloodgood’ and the Judas tree. 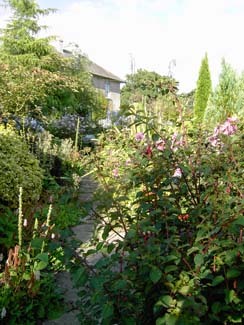 Mildred got rid of her roses but somehow they have crept back in again and there are over 80 from R ‘Bonica’ to R ‘Souvenir to St Annes’, there are collections of grasses, agapanthus, clematis and hellebores. Mildred likes to plant in colours with interesting combinations like Agapanthus clauescensagainst the glaucus foliage of R rubrifolia, mauve globes of allium amid waving violet Verbena bonariensis and deepest carmine Astrantia major ‘Hadspen Blood’, planted with reds and pinks. 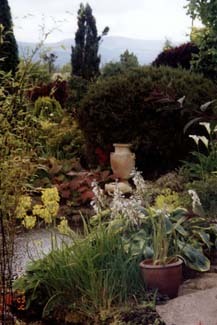 Picture a rill lined with primrose globes of scented Primula florindaeand diarama beside a scree bed, a shady peaceful area with ferns like the tatting fern and the painted fern, and damp loving plants beside the stream - and irresistible paths leading to a sundial or specimen tree. 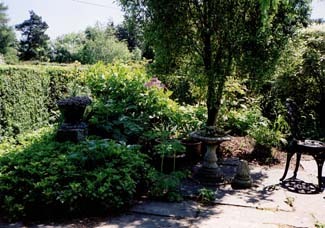 There are all kinds of inventive ideas, a clematis and rose arch leading to a seating area paved with old kitchen flags, a Berberis thunbergiitreated as a topiary globe, and urns filled with ruby sedums. In front of the house, a little farm gate at the end of a lawn surrounded by curving beds acts as a focal point. There’s a blue bed with the heavenly shades of Salvia patens and inky Agapanthus ‘Midnight Blue’, and a gold bed with Anthemis tinctoria ‘Sauce Hollandaise’, golden lilies and Stipa calamagrostis. Truly a garden where everything - colour, sight, and form - pleases the senses. Take N24 Waterford road from Clonmel, turn onto N76 for Kilkenny; take 2nd left at petrol pumps, 3rd right at sign for Killurney, then 1st left after school - the house is 1st on left.